Depending on the crowd and establishment, happy hour can occasionally get a bit messy. Though it's unlikely you've ever experienced any quite like the impromptu party that sprang up on the side of a road in Florida early Wednesday morning, when a tractor trailer overturned and scattered its cargo of 60,000 pounds of Busch Beer all across the shoulder -- a scene that likely would've saddened and excited most any passing frat boy. The incident reportedly occurred when the driver of the semi "failed to maintain his lane" near exit 45 on I-10 in Okaloosa County around 2:40am. 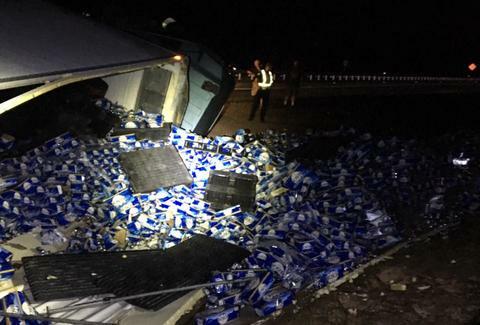 The big rig tumbled onto its passenger side on the north shoulder, causing the 30 tons of cheap light beer to be thrown from the trailer. Fortunately, the driver only sustained minor injuries in the crash, though the beer wasn't as lucky. If you figure a 30-pack sells for roughly $18 a pop, that puts the potential loss at nearly $48,000. It's unclear how much, if any, of the cargo was able to be recovered, or whether any of it will make it to its intended destination. But if you're in the Okaloosa County area, you may want to keep your eyes peeled for some deep discounts on Busch beer at your local watering holes in the near future.